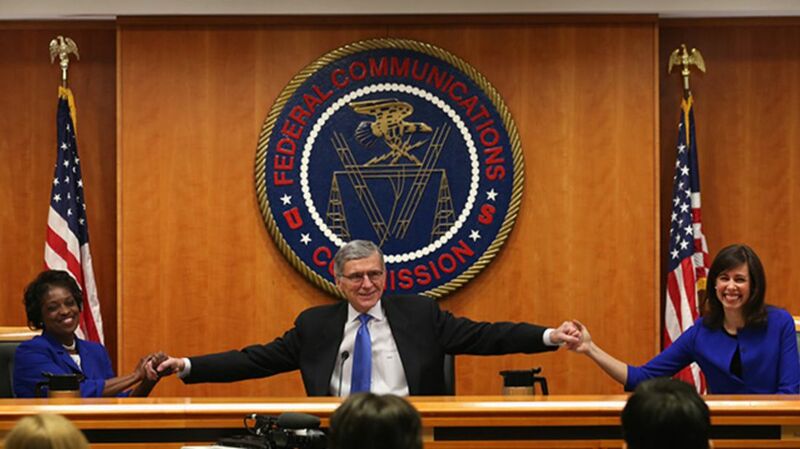 For proponents of Net Neutrality, this is a great victory. For deregulators (and broadband companies), this is just the beginning of a series of court challenges and Congressional action that will attempt to overturn (or weaken) the new regulations. A five-member FCC committee held a vote on whether to implement a new policy to regulate broadband internet providers. The vote was 3-2, split along party lines, with Republicans Michael O'Rielly and Ajut Pai voting against the new policy. The Internet is the most powerful and pervasive platform on the planet. It is simply too important to be left without rules and without a referee on the field. Think about it. The Internet has replaced the functions of the telephone and the post office. The Internet has redefined commerce, and as the outpouring from four million Americans has demonstrated, the Internet is the ultimate vehicle for free expression. The Internet is simply too important to allow broadband providers to be the ones making the rules. This proposal has been described by one opponent as "a secret plan to regulate the Internet." Nonsense. This is no more a plan to regulate the Internet than the First Amendment is a plan to regulate free speech. They both stand for the same concepts: openness, expression, and an absence of gate keepers telling people what they can do, where they can go, and what they can think. Let me start by issuing apologies. First, I am just sick about what Chairman Wheeler was forced to go through during this process. It was disgraceful to have the Administration overtake the commission’s rulemaking process and dictate an outcome for pure political purposes. It is so disturbing to know that those efforts were about illegitimately pushing a larger political cause mostly unrelated to technology. This administration went so far beyond what has ever been attempted, and its inappropriate interference in the commission’s activities will forever change this institution. Additionally, I am sorry to the staff members that were forced to prepare a half-baked, illogical, internally inconsistent, and indefensible document. For an institution that prides itself on quality of work and legal and technical expertise, this document is anything but. I guess that an artificial deadline to meet the radical protestors’ demands means that it is more likely that this item gets overturned by the courts because the work and thoughtful analysis needed to actually defend this completely flawed agenda is not included in the text. Today, a majority of the commission attempts to usurp the authority of Congress by re-writing the Communications Act to suit its own “values” and political ends. Clearly, there is a strong divide within the FCC about the core issue here. FCC Chairman Tom Wheeler on February 26, 2015. Photograph by Getty Images. Does This Change My Broadband Service Today? No. The full regulations haven't been published yet, and consumers should expect no change, which is kind of the point. Further, the FCC has said it will not seek to regulate the rates consumers pay for broadband, nor impose any new taxes or fees. Long story short, there will be plenty of court challenges. AT&T has already talked about what it plans to do, and FCC Chairman Tom Wheeler has said, "We are going to be sued." (Meaning the broadband companies do not wish to be regulated this way, and will certainly sue the FCC in an attempt to stop it.) The issue of Net Neutrality now heads (back) to the courts, and it may take years for the legal framework to be fully settled. It's also certain that Congress will get involved, with legislation that might accomplish some of the same goals but reduce the FCC's ability to oversee broadband providers. Stay tuned, folks. Meanwhile, the Internet Archive and the Electronic Frontier Foundation are holding a celebration tonight in San Francisco.